Bearbrass Asylum Orchestra did our first gig, many years ago, on the Quippings stage. Now we're back to perform with our favourite group of freaks and weirdos. 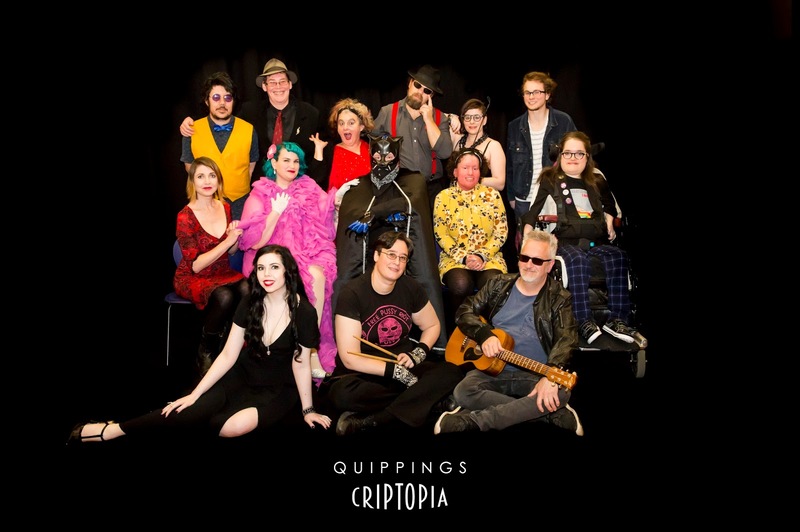 Quippings is Melbourne's wildest all-disabled cabaret, and this season takes us into their home territory: Criptopia, the stomping ground for all that is fabulously different and diverse. Quippings Criptopia stars and is directed by comedic legend Sue-Ann Post and features Emma J Hawkins, Kath Duncan, Carly Findlay, Sugar St Claire and Rowan White. Please note: Bearbrass Asylum Orchestra will only be playing on 17th and 25th September, but all of the shows feature fabulous acts. Access: Wheelchair accessible. Auslan interpreter on Sat 24th September. Image Description: A group of people with various disabilities sit and stand in rows against a black background. They are dressed as if they are visiting a red light district. Below them are the words Quippings Criptopia. 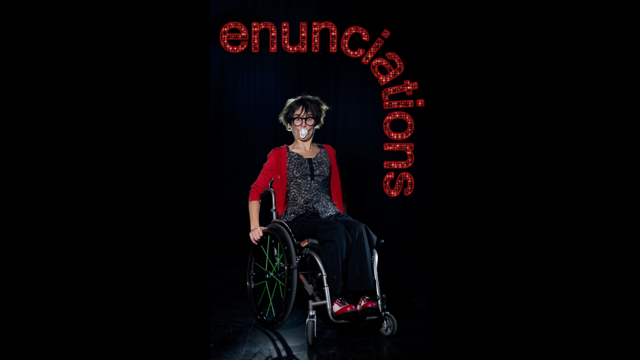 Our gorgeous lead singer, Jess Kapuscinski-Evans will be starring in a new play called Enunciations by Raspberry Ripple Productions. Have you ever felt that you don't belong? Ever told anyone? In Raspberry Ripple's first show, eloquent words - and some not so eloquent! - will be spoken by disabled and able-bodied performers to the the 21st century story of being in the soup together. Classic text will tug at your heart strings, new words discomfort you, both will make you fall off your seat with laughter and re-evaluate living in an ableist world. A discombobulation of thought, mind and matter! Written and directed by Kate Hood. Enunciations starring our lead singer Jess. Image description: A young woman with glasses sits in a manual wheelchair. She has a baby's pacifier in her mouth and is starring directly at the camera. The word enunciations appears behind her in shiny red lights. Bearbrass is going to be performing at the first ever Yarra Valley Music Festival. It'll be a whole day of music and market fun at the Yarra Junction Oval.There'll be food and market stalls, a bar, jumping castles and heaps of activities for the kids. Other acts include The Flaming Moes, Joel James and Alazarin Tribal Belly Dance. If you're very lucky we might even show off our own bellies. Venue: Yarra Junction Oval, 1 Park St Yarra Junction (Note: this is an outdoor gig). 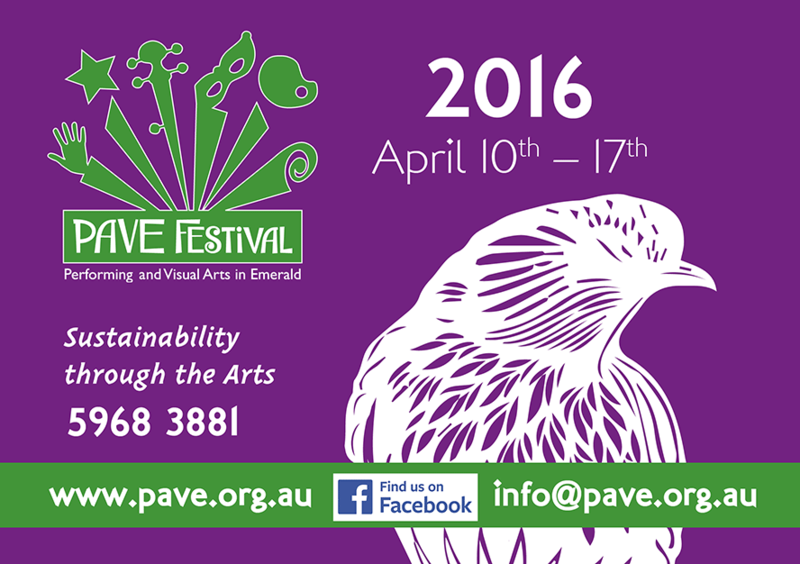 Come and see us strut our stuff at Emerald's PAVE Festival. Emerald is a beautiful little town situated at the foothills of the Dandenong Ranges and the PAVE Festival features some of the hills finest performing and visual artists. We'll be performing thanks to a brand new ramp built especially for us by the Emerald Men's Shed!